We have established a state-of-the-art infrastructure facility at our premises, which helps in streamlined execution of the business related activities. Sprawling over a vast area, this facility is equipped with high-tech machines and advanced technology that help in judicious utilization of resources and hence, make our range cost-effective. 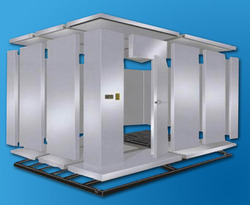 Our infrastructure has an accurate control & monitor temperature and humidity, gassing & room venting system. All the facilities installed at this unit are frequently upgraded so as to keep pace with advanced technologies and maintain high production capacity. Moreover, we have appointed highly experienced and qualified professionals in order to control the activities that are conducted at this facility. Furthermore, in order to maintain a conducive working environment, we have segregated our infrastructure into various units such as manufacturing, quality testing and R&D departments. 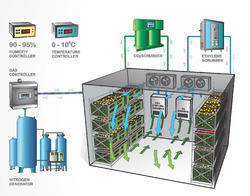 Gassing system to generate pure ethylene(99.5%), which is important for perfect ripening of fruits. We have developed an elaborated research & development wing at our premises so as to conduct all the research related activities in an organized way. This wing is managed by an innovative and qualified team of R & D professionals recruited by us. These experts conduct variegated researches with an aim to improve the quality and enhance the attribute of our offered range of products. Our researchers conduct extensive surveys so as to know the exact needs of our clients and accordingly modify the products. Furthermore, our research associates suggest the essential changes to the manufacturing department as per the technological advancements that take place in the market.